As we move into a new year and I bring my numbed brain back into gear, it’s time for you to remind me what you’d like to see on ABC since I’ve forgotten what you’ve requested last time. No promises, since it’s random what I do and when depending on what I feel like and what I can find information on, but requesting things will definitely move them up the list. As we transition into a new year, we can only hope it will be better than the last. Where ABC is concerned, I resolve to produce more creatures and keep up the high standard you have come to expect from the internet’s best encyclopedia of fabulous beasts. In 2015 ABC had a total of around 102,000 views from 27,000 viewers… in 2016 ABC has had about 300,000 views from 65,000 viewers! I couldn’t have done it without all of you. Join me in celebrating ABC’s 2nd New Year, and remember… omne ignotum pro terribili. Part of my job in curating ABC involves responding to email. While this can mostly be done from the safety of my email application, every now and then I get correspondence that requires a broader answer for the public good. How many illhveli species are there? I am planning a pleasure trip to Iceland – should I reconsider? The illhveli, or “evil whales” are a very specific grouping of Icelandic whales, which mostly share a few key features. There are 10 species of illhveli. As is evident from the image, they come in a dizzying variety of shapes and sizes, and are not necessarily biologically related. Due to the dangers involved in studying them, the scale given (with a human diver in the bottom left corner) is approximate. Inedible. In fact, it is a crime to eat them, and attempts to do so will result in their flesh disappearing from the cooking pot. The only exception to this is the skeljúngur, which is safe to eat. Evil. By and large illhveli are dedicated to the destruction of humans and other, benign whales, and take sadistic pleasure in death and destruction. Once again, the skeljúngur is an occasional exception, as it has been known to help worthy humans. If you have the misfortune to run into an evil whale, try making full speed towards the sun, whose blinding rays will dazzle the whale. If the whale is a raudkembingur, outracing it will cause it to die in frustration. Try making loud noises, or tossing items overboard to distract the whale. Any number of foul substances have been known to deter taumafiskurs, and will probably work on other illhveli as well. The steypireyður, or blue whale, is the mightiest of the “good” whales and is a valuable ally. It will intercept and fight any illhveli nearby. For that reason, do not harm or impede blue whales; in fact, killing one of those gentle giants may place a terrible curse on you. Not all evil whales are illhveli; the trolual and the ziphius, for instance, are not illhveli, although they share the Scandinavian waters with the evil whales and are no less bloodthirsty. They are also found alongside the hafgufa or kraken, which is bigger and more terrifying than any of them. In conclusion, I would say that your chances of getting shipwrecked are quite high, but I wouldn’t let that scupper your travel plans. I would steer clear of the sea if I were you, unless your boat was particularly fast or your captain was an Icelandic sorcerer. Avoid any suspicious-looking islands, but look out for blue whales. ABC will resume encyclopedic coverage on Friday. Thank you for your patience! Happy Newt Year! May 2016 bring you peace, joy, and ample amphibians. A huge thank you to all ABC readers! ABC has had over 100,000 pageviews since it started, and it wouldn’t have been possible without you. Yes, you. Let’s see what can happen in 2016! 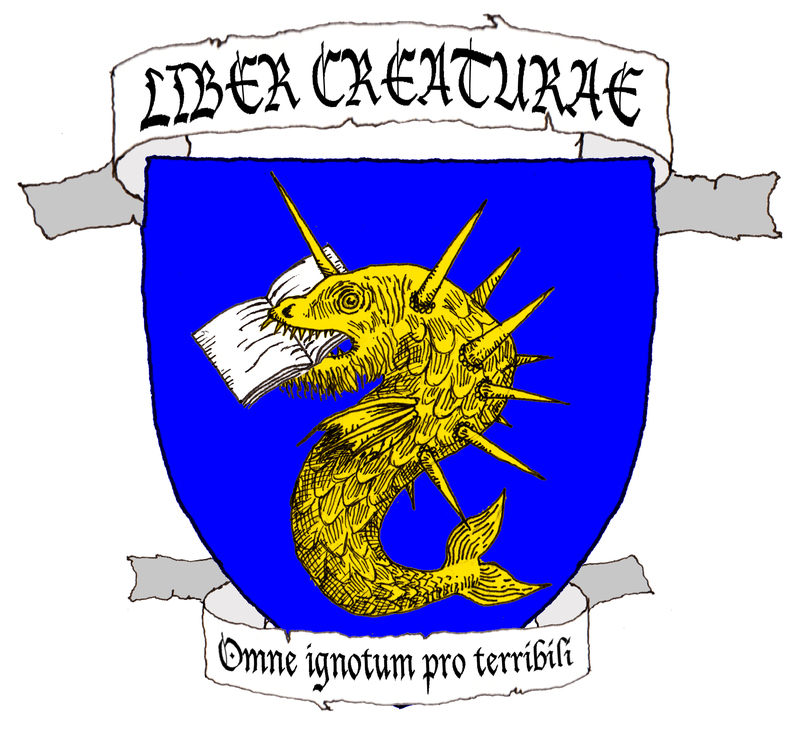 A Book of Creatures will be going on a brief hiatus for the holiday season, and will be back in January 2016. There may or may not be some extra doodles and digressions between now and then, but no encyclopedia entries. Thank you for reading ABC in 2015! Here’s a small sample of what to expect in 2016, and more creatures are forthcoming! In the meantime, be sure to leave a little offering outside for the callicantzari, it’s that time of year and they get nasty if they don’t have something to eat.